Nitrous, also known as laughing gas, has been helping Noblesville dental patients relax through treatment for years. This sedative is mild, temporary, and happily, low-risk. It’s ideal for children and others who have a hard time sitting calmly through treatment. Laughing gas could make a big difference in the way you experience your next dental procedure. Despite it’s good track record for safety, you should still know the biggest risks of nitrous oxide sedation. The primary danger of having too much nitrous is, ironically, not getting enough oxygen. Laughing gas is a mixture of nitrogen and oxygen. If there’s more nitrogen than oxygen, the brain can suffocate. Fortunately, this is a rare event in a supervised dental setting. This risk is usually associated with recreational nitrous use. Nitrous oxide administration can increase pressure in the sinuses. Avoid having any dental procedure soon after eye surgery as the pressure could damage the surgical site. Some ear problems also contraindicate nitrous. There’s evidence indicating that regular exposure to N2O is not preferable for reproductive health. But we don’t yet know how an occasional dose at the dentist’s could affect a developing baby. That’s why it’s best to talk to your obstetrician to determine if you need to avoid laughing gas during the critical first trimester of pregnancy. On the whole, nitrous is a very safe dental sedative. The safest, in fact. The likelihood that you could be adversely affected by laughing gas is very low. 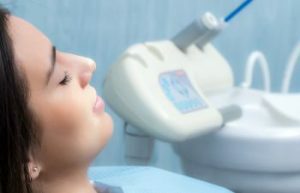 Just make sure you thoroughly share your health history with a dentist at Noble Smiles Dentistry before having nitrous oxide sedation. Talk with our team in person to find out if laughing gas is right for you.